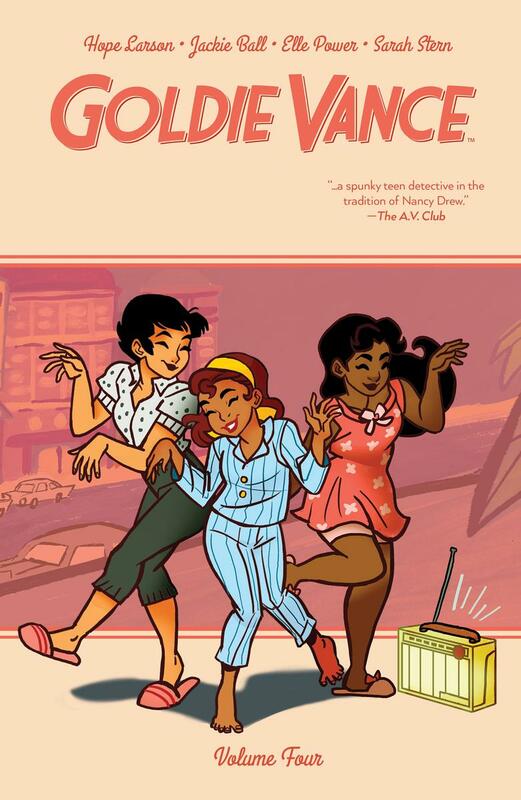 When I realized that this was the 4th volume in Hope Larson and Jackie Ball's Goldie Vance graphic novel series, I was nervous that I wouldn't be able to follow along, not having read the first 3. However, the story is self-contained and I was able to quickly get a feel for the characters and their relationships. Speaking of which, the only real question I have lingering that perhaps is addressed in earlier volumes, is the time setting. It's in Florida and radio stations are still using vinyl records and there doesn't seem to be smart phones. But Goldie is openly gay and no one bats an eyelash. Maybe it's a fictionalized version of early 80s Florida where everyone is accepting of one another's gender and sexuality?In any case, it's all very refreshing. Plot-wise, it's a bit over-the-top with Cold War era Russian villains who are embedding frequencies into records that can shut down electrical grids. Goldie, being the Nancy Drew-type she is, is on the case. It's a lot of fun and doesn't seem meant to be taken that seriously. Elle Power's art seems heavily manga influenced, especially in her characters. She didn't put much attention into background details which normally bothers me, but Sarah Stern fills the would-be white spaces with bright, almost neon colours that fit the mood and setting perfectly.